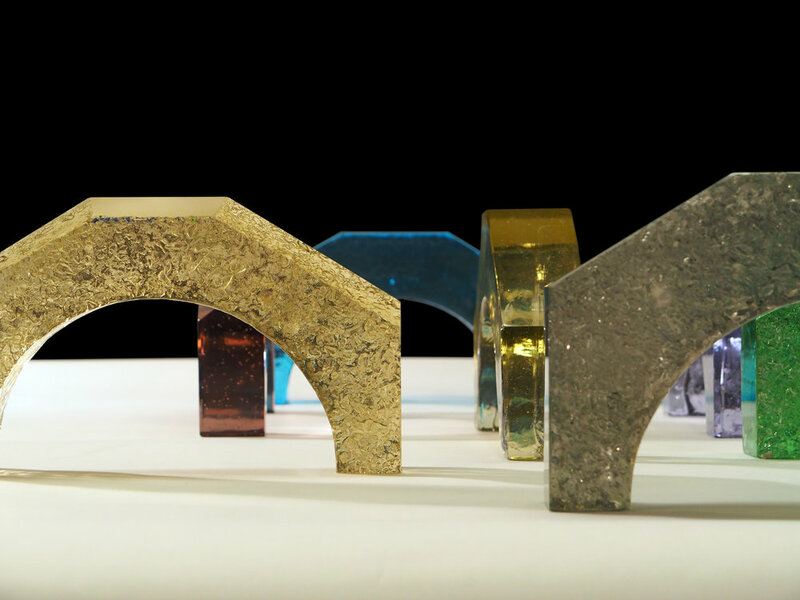 Through forty-one glass bridges, inspired by the style of Venetian bridges and Ottoman architectural forms, I aim to convey the artistic and commercial links between the two civilisations throughout several centuries as well as to offer a new bridge between the two cultures in this new modern era. At its peak, the Ottoman empire, ruling a vast area stretching from the Middle East and North Africa all the way to Central Europe, and the Venetian empires were trading partners. The Ottomans sold many raw materials including ash which was mainly for glass making to the Venetians, while Venice provided the Ottomans with finished goods. The same ships that transported everyday goods and raw materials also carried luxury objects including exquisite Venetian glass objects. As a result of this collective history, glass making on either side of the Mediterranean coast continuously influenced one other into present times. As ‘holy’ numbers, there is considerable connotation compiled into numbers 40 and 41 in Islamic world as well as other Eastern cultures. The first prophet Adam reached heaven after 40 years of age; there were 40 women and 40 men on Noah’s ark: Muhammed became a prophet at age 40.. These religious particulars also affected traditions: A new-born leaves home only after 40 days; there is a gathering for someone who passes away on his or hers 40th day of burial; and almost every day a Turkish person says ‘41 times Mashallah’, one more than 40, to praise good fortune and keep the evil eye away.. So, it is only natural for mer to target 41 bridges, symbolically in relation with 400+ Venetian bridges, a multiple of 41, corresponding to a holy number in this context. Within the context of Glass Week, I have been studying different sub-techniques of glass making in Murano that I aim to in cooperate into my resulting art. Through the interactions with the glass masters on the island, I propose to use several techniques: calcedonio, rugiada, ghiacciato, scavo, corroso, velato and pulegoso. I aspire to showcase Muranese glass making techniques in the international arena as well as adding these unique techniques into my craft-making repertoire. It has also been exceptionally meaningful for me as a glass artist to be introduced to colour making on the island which is very different than what other studio glass centres practice in America as well as Europe. Muranese ateliers continue to make their own colour ranges and therefore the variety is exceptional which will be imminent in my final artwork.